Before I go for lunch I thought it would be a good idea to share what I've been doing. Yesterday I brought OBSTACLES to a local meetup that I run called 1GAM Galway. You can read about that meetup here. 1GAM Galway is a game dev meetup I run that follows the onegameamonth.com challenge and a serves as a time and place for game developers and hobbyists to play each others game projects, give feedback and chat. 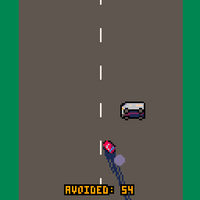 I plan to treat this 8-bit gamejam mess-about a bit more seriously and see if I can make it more fun to play. So I've adopted a versioning structure for releases. I've been going ham with versioning this morning, using it for minor changes and releasing them to the site. Then working on it more and doing it again. Today I have updated the game page with about 5 builds since breakfast. In the future I won't be as aggressive with updates - I was simply excited to get them out so that people who might play it this morning would be able to have a little more fun. Now that versioning is in place I am able to very easily see what changes and improvements I've made for each version of the game. So it makes it easy for me to write up a Changelog. Have a look below for the updates. 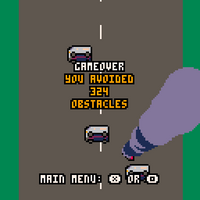 Added new spawn rate for obstacles. More spawn as time goes by making the game increase in difficulty and excitement. Added in a tire track graphic when turning your vehicle. 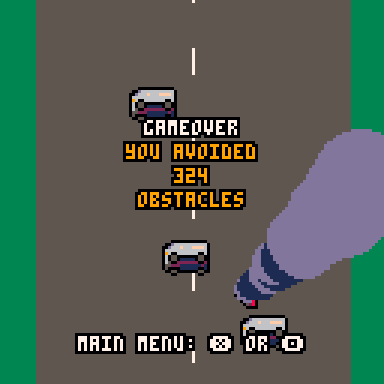 Modified the gameover screen controls so you don't quit to the main menu accidentally after crashing your vehicle. Notes: Players get into difficulty from around 230 avoided obstacles and soon crash. The manner in which the obstacles spawn will likely get a lot of tweaking to make the game more enjoyable. I welcome your suggestions. Added version number string to main menu. Fixes alignment of input hint text on game over screen. Adjusted car handling input, now holding left and right buttons creates a steady state. Simpler car y-axis movement. 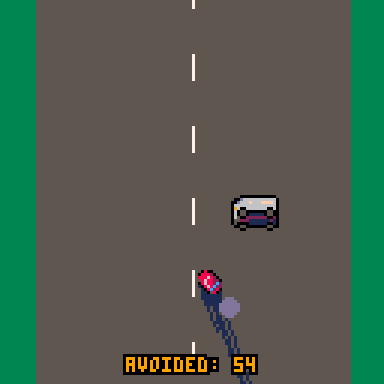 Accelerating/decelerating no longer affects the 'world' speed - also fixes graphics glitch with road. Increased the car's y-axis movement rate.